Home / News, Views & Updates / Best of Luck! Best of luck to our NEBOSH International Diploma in Occupational Health & Safety delegates who are sitting their Unit A, B & C exams next week in Dublin. 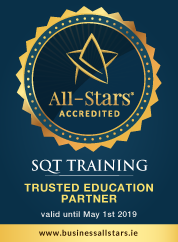 Last September, 15 delegates from the Food, Pharmaceutical, Medical Device, Technology, Engineering and County Council environments commenced this much sought after qualification, under the excellent stewardship of their SQT tutor Finbarr Stapleton. After months of hard work they are ready for the next step so we wish them all the very best.